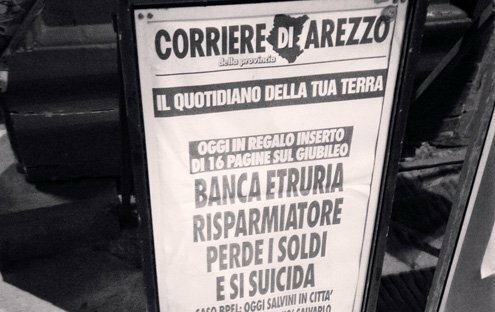 Italian media covered the Banca Etruria scandal in loud words. ’ve been thinking about losing things recently. Faith mostly. Not religious faith, but faith in institutions. Probably not the best recipients for faith, you’ll say. Better off having faith in an idea, a religion, an all-forgiving God. Maybe. But I work with institutions. I don’t work with the Catholic Church — not regularly, anyway. My recent translation of Pope Francis’s first Italian-language book due out Jan. 12 constitutes an outlier. More to the point, the work wasn’t for the pope or the Church, but for a publisher, another institution. Among the institutions I’ve lost faith in — and forgive my innocence if I am the last one to the table on this matter — are banks. I thought they were safe repositories for cash. But the recent scandal at Banca Etruria, a small Arezzo-based bank with a long history in Tuscany, has changed my mind. Refused a bailout by the government, the bank administrators decided to use its clients’ savings bonds to band-aid its wounds. Individuals, everyday normal people, who had their money invested in these seemingly safe bonds, lost everything. Stories of suicides are now coming in. That they took this action over the Thanksgiving means nothing since Italy doesn’t celebrate Thanksgiving, yet for an American the irony just sharpens the pain. Isn’t small supposed to be some sort of guarantee of the genuine, the safe, the reliable? Especially in artisan-rich Italy, where it’s family-owned this and family-managed that? No marketing here! We’re local! Sure, the bank wasn’t actually a bottega, but the people who worked in it knew their clients well. Their children grew up together. They lived near each other. As destiny would have it, on Thanksgiving Friday I had a turkey dinner with a group of 10 people. I was introduced to, and sat next to, the special commissioner called in to investigate the bank’s problems. He casually chatted about restaurants, golf, places to go, places not to go. He told me about his experiences in California. When I heard about the bank’s actions hours after the dinner I realized that when we sat down for that Thanksgiving dinner he’d already decided how to solve the bank’s problems. He knew his actions would bring about great suffering. He didn’t care. He didn’t lose sleep over his decision. And he probably won’t in the future. But I do. I continue to think about those very normal, everyday people who trusted in that bank and who woke up one morning to find their savings accounts emptied, their retirement plans gone up in smoke, their hard work all for naught. The American Bernie Madoff scandal torpedoed lots of rich people who’d invested millions but had other millions to spare. This is something different. It’s more like family betrayal. While I’ve known suffering of the most intense kind — death of loved ones, murder of loved ones — here’s social wrongdoing that hurts me intensely. Above all because it represents the triumph of greed.